DEBORAH CURTISS "Selected Drawings/Paintings from this Century"
“Selected Drawings/Paintings from this Century” by long-time Philadelphia artist, Deborah Curtiss, may be her “swan-song” to Germantown and Philadelphia as she relocates to the Pacific Northwest. Featured are diverse works created since 2002: “Palimpsest” paintings inspired by figurative sculpture and architecture of Italy, “Pentimento” paintings stimulated by snowscapes of early 20th century Bucks County artists, and fragmented “persevering” figure drawing/paintings, a subject to which Curtiss was devoted for many years. The works are unified by their “trapezial” shapes: four sides of unequal length. A contributor to the creative life of Germantown since 1985, Curtiss specifies that all proceeds from the sales of her worksbenefit the non-profit iMPeRFeCT Gallery. The works will be sold through a silent auction, where their minimum bids will begin at a fraction of their worth, and it will conclude the exhibit on March 18. Visit this link to participate in the AUCTION. The gallery's project room, the ReDRooM, features the installation "WE RISE" by Eddie Einbender-Luks and Amanda Booth.These exhibits will run from February 18 to March 18, 2017 with an opening reception on Saturday, February 18 at 6 pm. Besides being an awesome human being, Deborah is a graduate of Yale University School of Art and the University of the Arts (where she taught until 1998), and known internationally through her work in visual literacy, Curtiss’s art is represented in collections in Canada, France, Germany, Israel, Kuwait, Japan, Scotland, and throughout United States, including the Philadelphia Museum of Art. About the installation "WE RISE"
WE RISE is an expression of our societal desires and struggles to find our identity as a nation; we look to the future with hope and recognize that the answer is in the process and embracing our diversity of voices. We must take action and stand up for what is just. Thank you. 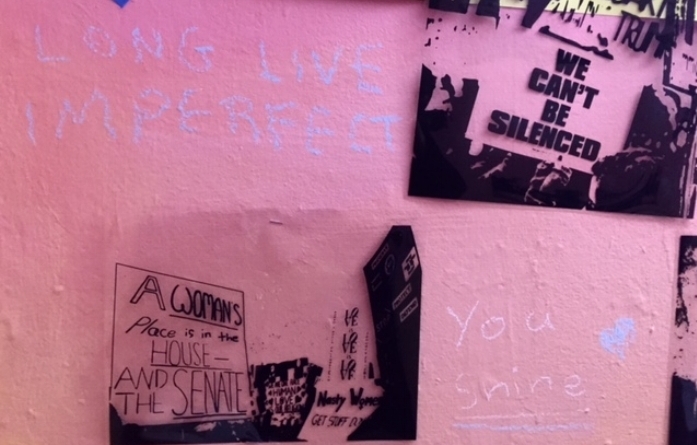 Messages on the wall of "WE RISE" by Eddie Einbender-Luks & Amanda Booth.